SAWA’ speciality water and water waste division offers turnkey design, build and operate (DBO) solutions that bring facilities into operation in the shortest possible time frame. At SAWA, we provide a full range of water work services. The combination of our experience and expertise at SAWA, means we can provide clients with support at every step of the project and deliver a job completed to the highest of standards. Pipe laying from small PVC to over 1000mm DI pipes. Borehole and community well design. Water and wastewater plant and facilities design or redesign. Pressure filters are used for the filtration from groundwater or high quality surface water that does not require clarification. In groundwater systems they can be used for the removal of iron and manganese in addition to turbidity. Lamella plates are designed to remove particulates from liquids. They are employed in primary water treatment in place of conventional settling tanks and are used in industrial water treatment. Tube settler systems are an inexpensive solution for drinking water and at SAWA we use these to increase treatment capacity, reduce new installation footprints, improve effluent water quality, and decrease operating costs. SAWA also designs & builds pump houses complete with piping, pumps and switchgears. Solar pumping systems allow vital water resources to be accessed in remote rural locations. Solar water pumps require no fuel and minimal maintenance. 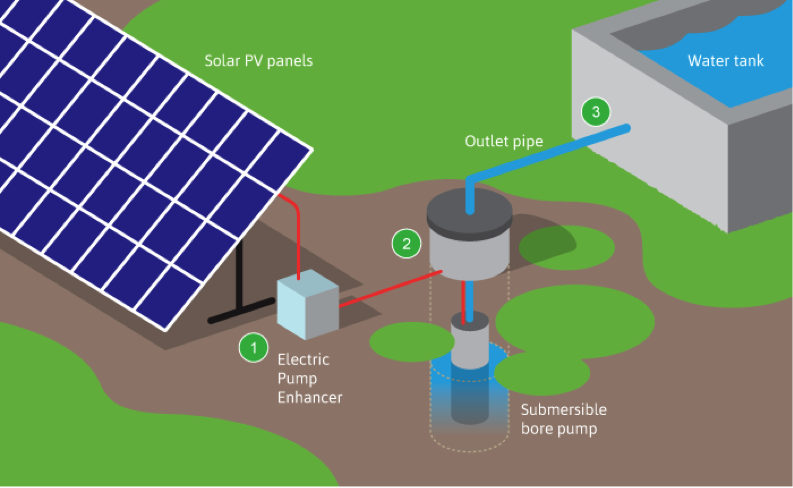 Solar pumping systems are capable of running all types of electrical water pumps with applications varying from irrigation to household demands. Irrigation pumps such as submersible, surface or deep well can also be coupled with irrigation systems to enhance the returns of this configuration. A solar water pumping system is determined by the output or number of liters required per second/minute/hour/day. Once determined we are able o to calculate the number of solar panels required to run the necessary pump.A 1000 Wp solar water pump is capable of drawing and pumping approximately 40,000 litres of water per day from a source that is up to 10 meters deep. This is sufficient to irrigate about 2 acres of land with regular crops. A 1000 Wp solar water pump helps save up to $1,000 when compared to equivalent use of a diesel-operated pump over a year. Each solar array has a number of solar modules connected in parallel or series. Every solar PV panel generates current by converting solar radiation to electrical energy. The electrical energy from the entire array is controlled, tuned and directed by the inbuilt controller in DC pumps or through the Variable Frequency Driver(VFD) and enables the connected pump (may be submersible or surface) to draw water and feed the delivery pipelines. The water thus drawn from ponds, rivers, bore wells or other sources by a solar water pump is pumped to supply water as required. It can be stored in tanks from where it is later channelled to fields or the supply from the pump may be coupled with drip irrigation systems to provide optimised water to fields directly. Our irrigation schemes focus on the production of crops, livestock and fish for both domestic consumption and export, therefore ensuring the alleviation of persistent food deficits while creating jobs also. Reinforced concrete water structures are another specialty at SAWA. Reinforced concrete is durable and on par with steel and is ideally suited for water retaining structures like ground and overhead tanks. Sewage treatment plants allow for the breaking down of solids to produce a cleaner, more environmentally friendly sewage. Certain non-electric sewage treatment plants can be solar-powered if required. Sewage piping will ensure that an underground carriage system is specifically ready for transporting sewage from houses and commercial buildings through pipes to treatment or disposal. Our waste to energy (WTE) projects use advanced technology solutions to generate green energy from waste and help in landfill diversion by as much as 90% through reduction in the volume of waste disposed, thereby maximising the value of waste streams and minimising the environmental impact. Waste to energy facilities recover energy and metals from rubbish that cannot be recycled. A waste to energy (WTE) project may allow you to generate a range of outputs: electricity, district heating, steam for industrial processes, desalinated seawater and even district cooling. In this way, residual waste that cannot be recycled in an economic or environmentally beneficial way becomes a valuable local source of energy. Additionally, in most configurations, waste to energy (WTE) projects outperform alternative waste treatment processes in terms of their carbon footprint and other impacts on the environment. It is our expertise and experience of how to best plan, obtain and manage the implementation of waste-to-energy projects, in combination with our technical knowledge of mechanical and electrical equipment that is our unique set of capabilities.